first lady of the stage! I couldn't help it. When I saw the name of this polish I insantly thought of that song from "Phantom of the Opera". That's a great musical by the way. I'm not a huge theater or musical person, but I do enjoy Phantom and few other shows. Anyways Prima Donna is another one of those color changing polishes in the sun. I was really pleasantly surprised by this one. Out of the 4 I got this was the only creme/jelly polish I got and it sure delivered! Look at that pretty bubble gum pink jelly! I had no idea this would be a jelly before putting this on. Sure, there is VNL (visible nail line), but I actually don't mind it in this case. When in the sun Prima Donna goes from a bubble gum pink to a purple plum. Great color! I love the dramatic change between these colors. I also think these are universally flattering colors in the sense that they can go with anything. 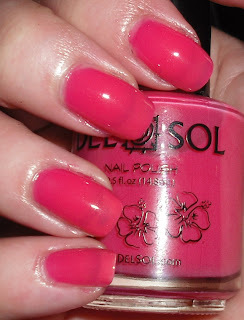 This is another great polish from Del Sol in my book. I haven't been disappointed yet. I also know they just recently released at new Halloween nail polish color! You can purchase Del Sol at some select Walgreens (I have yet to find them at any near me) for I think $7.99, on their website for $10 each or Buy 3 get 1 free, or in their free standing stores if you happen to live in a touristy or beachy area. WOW, WOW, WOW. Amazing! I need this, I really do. So cool. I have some Claire's Mood polishes but none of them have this huge of a change. The Del Sol kiosk must have moved becuz I was at the Mall last Friday and it wasn't in it's usual spot. I love this! I love the pink and the plum. I didnt even realize there was vnl until i read your post lol. Excellent! And thats a lot from me regarding a pink. I always read your posts however I rarely comment on the pinks/reds...you know me. But I was greatly surprised to see this wasn't only a color changing lacquer but a creme/jelly to boot. Very nice. I'd be totally sold on it if it was the darker color in the shade and turned pink in the sun...but hey, can't have em all. I always think of Phantom when I hear the phrase "prima donna"! :) And I really like this color...very pretty! This is adorable! I love the color changing. Del Sol has a website that you can get over 24 different colors! And yes, even some that change to pink! The website is simply delsol.com it also shows you the store locations on the website and they now sale their nail polish in most Walgreens.